New Delhi: Relations between the US and Pakistan will worsen further if the South Asian nation doesn’t change its behaviour and crack down on terrorism, said Robert Blackwill, former ambassador to India, on Friday. The former envoy made the remarks at an event in New Delhi on the day US secretary of state Hillary Clinton called on Pakistan to take action within “days and weeks" on dismantling Afghan militant havens and encouraging the Taliban into peace talks in order to end 10 years of war in Afghanistan. Clinton, on a day long visit to Pakistan, said Islamabad had a “critical role in supporting Afghanistan reconciliation and ending the conflict". “We look to Pakistan to take strong steps to deny Afghan insurgents safe havens and to encourage the Taliban to enter negotiations in good faith," said Clinton after talks with Pakistani foreign minister Hina Rabbani Khar, AFP reported. The US was looking for operational action over “not months and years, but days and weeks because we have a lot of work to do to realize our shared goals," Clinton said. Ties between US and Pakistan have deteriorated dramatically this year specially after the 2 May killing of Al Qaeda leader Osama bin Laden in Abbottabad, near Islamabad. The tense relations were exacerbated by US accusations of the Pakistan-based Haqqani network being behind the 13 September attack on the US embassy in Kabul. Remarks by then top US military officer, Admiral Mike Mullen, describing the Haqqani network as a “veritable arm" of Pakistan’s Inter-Services-Intelligence (ISI) angered the ally. 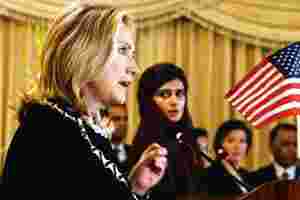 On Friday, Clinton called on Pakistan to step up cooperation “to squeeze the Haqqani network and other terrorists... Trying to eliminate terrorists and safe havens on one side of the border is not going to work. It’s like that old story: you can’t keep snakes in your backyard and expect them only to bite your neighbours... Eventually those snakes are going to turn on whoever has them in the backyard". Islamabad has so far refused to open an offensive against the Haqqani network. In her remarks, Khar said both sides could cooperate more and achieve “better results", without giving details. In New Delhi, Blackwill noted that after years of India trying to convince the US against giving Pakistan arms for the war on terror, Indian concerns “now have been accepted, digested and embedded in US policy". He was referring to increasing voices in Washington calling for aid to Pakistan to be calibrated against action it took to clear terror havens.